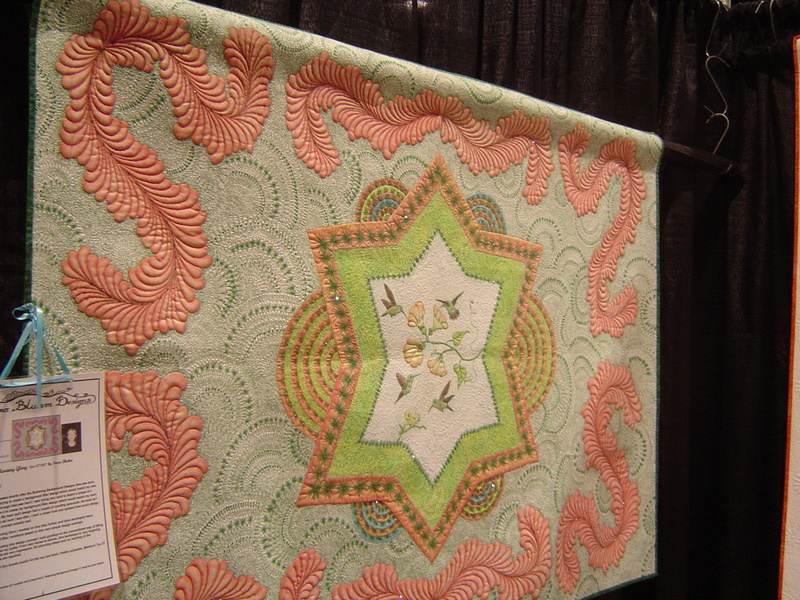 Last month I went to the Machine Quilter’s Showcase in Kansas City. This may be discussed in the podcast a little bit (no – not ready to record the rest yet – voice still bad). Since I haven’t been recording, lets just put up gratuitious (but yummy) pictures of quilts that I will take a long time to gain the excellent skills shown here. Very different being at a national show vs. a local show, but at the same time – not. Hard to ‘xplain. This time I was BAD BAD BAD in getting credit for what was due each quilter so I don’t have any names of quilts and quilt artists, but if YOU happen to see your quilt in this post, comment below and I’ll try to get it in a corrected post later. 1) Thread painting at the beach. Black quilt. All the color done with thread. Awesome! More thread painting of parrots! More thread painting (I think) of geisha. 2) This quilt was white to start with and details were colored in by the quilt artist! Subtlety of red and purple on this quilt. 3) I saw a listener’s quilt – Vicki’s mouse’s eye quilt – in person. Boy the beading on that was amazing! I was speechless to see something I had seen on the blog in person. 4) Photographs and real objects for inspiration. I loved this cat picture quilt with picture board. 5) Many spirograph style quilts, many done on black. Takes me back to the 80’s and little gears with numbers on them. 6) Color study. The following quilts I liked particularly for their color choices. Who says some colors don’t mix? The triple nine patch convinces me that I can do aqua (one of my favorites) with red and it can be striking. A veritable conglomeration of colors on this quilt just make me smile. Lime green has a place next to purple if needed! And the background on this shows that not every quilt needs to be backed with white (or variation) or black (or variation) to be effective. … that’s all for today. I’ll break up this eye candy into several posts so you can have some continued quilty goodness for the week! Red and aqua are a beautiful colour combination. I’ve seen some stunning quilts in these colours in the blogosphere lately.